When you are in the process of creating your brand, you need to think about a lot of things. Among the items which should be on your checklist is the logo. You need to find a symbol that will represent your brand, something that is memorable, but nothing too cluttered. Facebook which has the popular “F” logo is the best example for using the business name as the logo. While the acronym of your company can be the easiest option when you want to make a logo, it can be too boring. So, you might want to choose either an abstract symbol or an image. Popular symbol logos include that of Nike, and Adidas. These may be memorable, but you need to spend considerable time to figure out which symbol would be the best representation for your brand. Finally, there are images. American Red Cross and Apple use images as their logo. 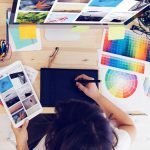 In addition to knowing how to use the four fundamentals of great business logo design, here are some extra things to keep in mind when it comes to custom logo design. What kind of personality do you want the logo to convey? This is a major consideration that will, most likely, distinguish an advertising agency from a local bakery. Yes, you have to look to your competitors for some guidance. Their logos can give you a better idea of what kind of logo you should have. Of course, you should never imitate someone else’s logo. Your logo can be in a lot of places. It might be in a prominent position in your website, but it can also be on the product’s packaging, on signage, and even in brochures. So, you need to have a logo that will look great on all of the different mediums. Even if you plan on using an abstract symbol or image, you need to think about the logo’s relevance to the industry. The red cross symbol is often associated with hospitals or healthcare, so it wouldn’t be ideal to use it for an advertising agency, for instance. Logos should look great not just in color but also in black and white. Apple’s logo is one of the perfect examples! Another point to consider is to minimize the colors in your logo, because more colors can make it more expensive especially if you require printed material. A logo will be the main representation for your brand, so you want it to look attractive and memorable. You can do the design yourself, but it would be best to hire a pro who can provide you with advice and suggestions on what would work best for your brand. Of course, you need to find a provider who will listen to what you want. Lastly, once you have a logo for your company, do not forget to trademark the logo. After all, thanks to all these tips, your business logo design would for sure be something that you want to protect.